October is just around the corner and you know what that means! Time to gear your players up for Breast Cancer Awareness month. We have tons of different options from crew socks to over the calf socks. Not to mention, different color options to meet your needs. We have black & hot pink socks, all pink socks, Hot Pink & Pink, and we even have the digital camo black & hot pink socks! All of the Twin City Knitting socks have a ribbon on them, whether it be on the back, side, or front of the sock, we’ve got you covered! The socks have moisture control, blister control and odor control technology, these socks are perfect to keep your feet dry. The breathable mesh fabric will make these socks feel nice and light on your feet. Support the cause and get your Breast Cancer Awareness socks today! Each and every day, people all over the world battle breast cancer. Researchers work towards a cure, while millions everywhere live with the disease. Every October, we take some time to bring that fight to the forefront. For the last 25 years, October has been designated as National Breast Cancer Awareness Month in an effort to increase awareness of the disease and to raise funds for research into the cause, prevention and cure. Like many companies, Sports Unlimited has been affected by cancer, and we have always stood by our employees and their families as they battle. 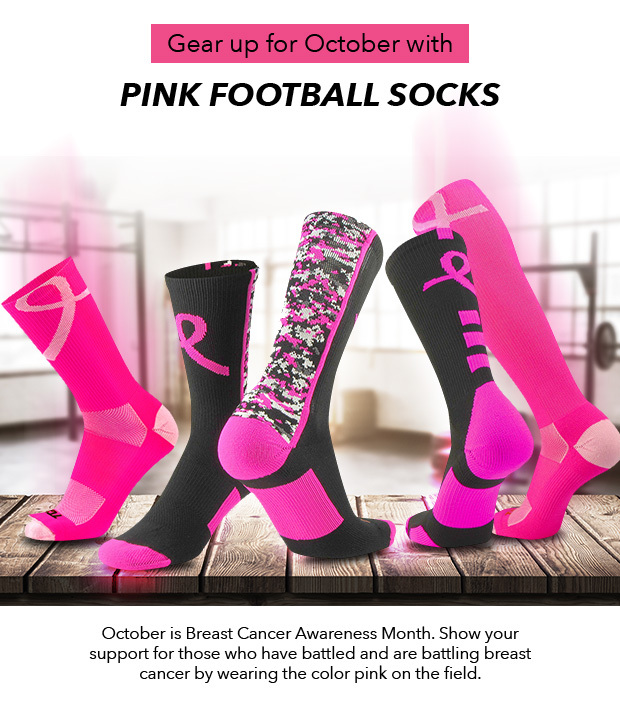 In an effort to contribute to and support the fight, we at Sports Unlimited have created a specific section of products that support breast cancer research; “Think Pink – Join the Fight Against Breast Cancer.” This section is filled with apparel and other items adorn with the official Breast Cancer Awareness ribbon. A portion of their sales will be donated to breast cancer foundations to help find a cure and support those whose lives have been affected. One extremely popular item amongst this collection are the Cutters 017Q Pink Breast Cancer Football Receiver Gloves. These gloves have become a staple in the NFL during Breast Cancer Awareness Month, and as one of Cutters’ biggest suppliers, we are one of the few places that carry them. Additionally, we are running a Facebook contest to win an Under Armour Power in Pink hoodie. Post an inspiring story, talk about a loved one, share a memory, post a hopeful picture or just share your support on our Facebook page. On October 18th a random winner will be chosen.